Author: William Leiss, Stephen Kline, Sut Jhally, Jacqueline Botterill Publisher: Routledge () Buy this book from Amazon or Chapters. This new edition of Social Communication in Advertising updates the most comprehensive historical study of advertising and its function within contemporary society. 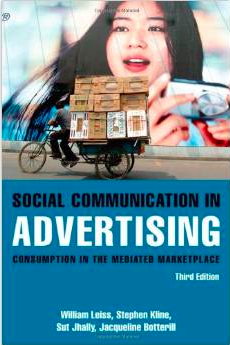 This classic text traces advertising’s influence within three key social domains: the new commodities industry, popular culture, and the mass media that manages the constellation of images that unifies all three. This entry was posted in Books and tagged advertising, book, communication. Bookmark the permalink.